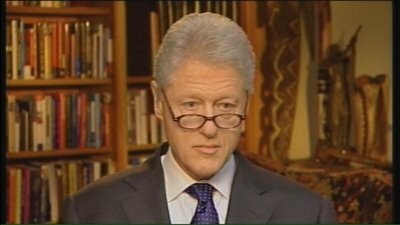 PAPA ROBBIE.NET: Bill Clinton as VP??? The prospective presidential candidacy of Hillary Rodham Clinton has given rise to plenty of speculation about the notion of Bill Clinton as the nation's first gentleman. But what about another role? How about, say, vice president? Politically, of course, the idea is a non-starter for all sorts of reasons. But that doesn't stop the parlor games, especially on the Internet. The issue came up last week during a chat on washingtonpost.com: What if Hillary picked Bill as her running mate? A Post reporter rashly dismissed the idea as unconstitutional. But that only proved the dangers of unedited journalism. The answer, it turns out, is not so simple. Could Bill Clinton be Hillary Rodham Clinton's No. 2? He could not be elected president again, but some say he could succeed from the vice presidency. A subsequent sampling of opinion from professors of constitutional law, former White House lawyers and even a couple of federal judges reveals a simmering disagreement on whether a president who has already served two terms can be vice president. Some agree with the conclusion that the presidential term limit embedded in the Constitution bars someone such as Clinton from returning to the White House even in the No. 2 slot. Others, though, call that a misreading of the literal language of the law. As the former president might say, it all depends on the meaning of the word "elected." Under Article II of the Constitution, a person is "eligible to the Office of President" as long as he or she is a natural-born U.S. citizen, at least 35 years old and a resident of the United States for 14 years. The 12th Amendment says "no person constitutionally ineligible to the office of President shall be eligible to that of Vice-President." Okay, so that means if you're not eligible to be president, you're not eligible to be vice president. Makes sense. What would be the point of electing a vice president who can't succeed the president in case of death, incapacity or vacancy? But then Congress and the states added the 22nd Amendment in 1951 to prevent anyone from following the example of Franklin D. Roosevelt, who won four terms. That's where things get dicey. "No person shall be elected to the office of the President more than twice," the 22nd Amendment says. On its face, that seems to suggest that Clinton could be vice president because he is only barred from being elected president a third time, not from serving as president. That's the argument of Scott E. Gant, a partner at Boies, Schiller & Flexner in Washington, and Bruce G. Peabody, an assistant professor of political science at Fairleigh Dickinson University in New Jersey. The two wrote a law review article in 1999 called "The Twice and Future President" and reprised the argument this summer in the Christian Science Monitor. "In preventing individuals from being elected to the presidency more than twice, the amendment does not preclude a former president from again assuming the presidency by means other than election, including succession from the vice presidency," they wrote. "If this view is correct, then Clinton is not 'constitutionally ineligible to the office of president,' and is not barred by the 12th Amendment from being elected vice president." Others share that opinion. Three former White House lawyers consulted by The Washington Post (two who served President Bush and one who served Clinton) agreed that the amendment would not bar Clinton from the vice presidency. A federal judge, who noted that he has "no views on the matter," said the plain language of the amendment would seem to allow Clinton to "become president through succession." Kathleen M. Sullivan, director of the Stanford Constitutional Law Center, said the 22nd Amendment, "as I read it, does not preclude a Clinton-Clinton ticket." She added: "Bill, if elected VP, could become president in the event that President Hillary became incapacitated; he just could not run for reelection from that successor post." Still, that view is not universal. Judge Richard A. Posner of the U.S. Court of Appeals for the 7th Circuit said by e-mail that "read literally, the 22nd Amendment does not apply" and therefore Clinton could be vice president. "But one could argue that since the vice president is elected . . . should he take office he would be in effect elected president. Electing a vice president means electing a vice president and contingently electing him as president. That interpretation, though a little bold, would honor the intention behind the 22nd Amendment." Bruce Ackerman, a constitutional scholar at Yale Law School, also pointed to original intent in addressing the issue in his book this year, "Before the Next Attack: Preserving Civil Liberties in the Age of Terrorism." The amendment, he wrote, "represents a considered judgment by the American People, after Franklin Roosevelt's lengthy stay in the White House, which deserves continuing respect" and "should not be eroded" by a narrow interpretation allowing someone to manipulate his way to a third term. Eugene Volokh, a law professor at the University of California at Los Angeles who was a clerk for Sandra Day O'Connor when she was on the Supreme Court, focused on the broader meaning of the language in the amendment in reaching the same conclusion. "My tentative answer is that 'eligible' roughly means 'elected,' " he wrote on his Web site, the Volokh Conspiracy, this summer, meaning that if Clinton cannot be elected president, he is no longer eligible at all. One constitutional lawyer not heard from on the issue is William Jefferson Clinton, Yale Law class of 1973. But he has offered thoughts on the 22nd Amendment. Before leaving office and again in 2003, he suggested amending the amendment to let a two-term president leave office and then run again: "Since people are living much longer . . . the 22nd Amendment should probably be modified to say two consecutive terms instead of two terms for a lifetime." Now, who might he have had in mind?